In this tapestry "Angels Playing Violin", we see three angels by French artist William Bougeureau, a detail from a piece called Song of the Angels (1881). The works of Bougeureau focused on the female form whether it was a mythological piece, portrait or religious work. Here we see the angels performing music including the playing of the lute and the violin. His interest in religious works resulted in many pieces which render scenes which coupled with his imagination with religious themes and subjects. In the original the angels are looking at Mary with child. 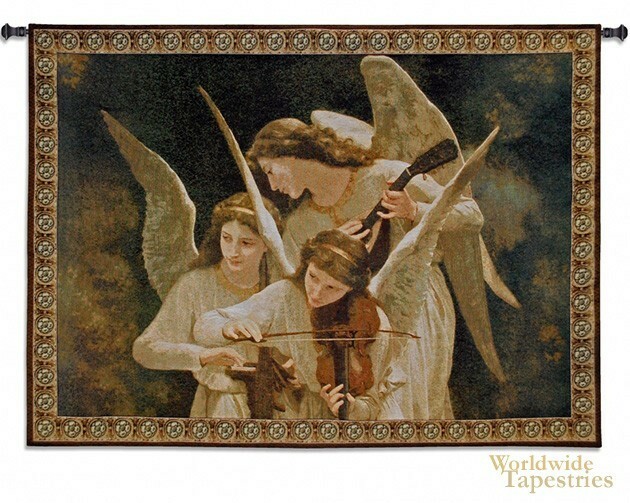 This tapestry "Angels Playing Violin" is backed with a lining and has a tunnel for easy hanging. Note: tapestry rod and tassels, where pictured, are purchased separately.